Manual and thermostatic radiator valves. 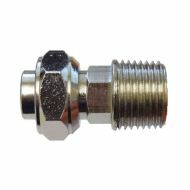 The tappings in a radiator are usually a standard 1/2 inch BSP female thread (see BSPT link at bottom of page for more info on plumbing thread sizes). 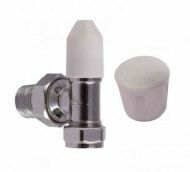 Some radiator valves use a large union nut and tail, and others use a 15mm compression connection to the tail. Angle radiator valve with 10mm microbore compression pipe connection. Supplied with wheelhead and lockshield caps. 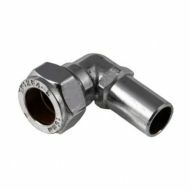 Chrome plated 15mm compression street elbow fitting. Compression plumbing fittings do not require heat or solder. 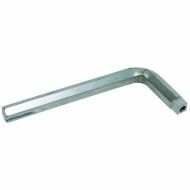 They can be used with copper or plastic pipe and are suitable for hot and cold systems. Chrome plated brass 15mm radiator valve, with standard 1/2 inch male BSP connection for radiator. Radiator valve with 15mm compression pipe connection and 1/2 inch threaded connection for radiator. Compete with wheelhead and lockshield caps. 15mm angled radiator valve with drain off point. 15mm straight radiator valve, complete with wheelhead and lockshield tops. Standard 1/2 inch threaded connection for radiator. Pair of all chrome contemporary angled towel warmer valves. 15mm pipe connection and standard male 1/2 inch BSP connector to suit radiator. 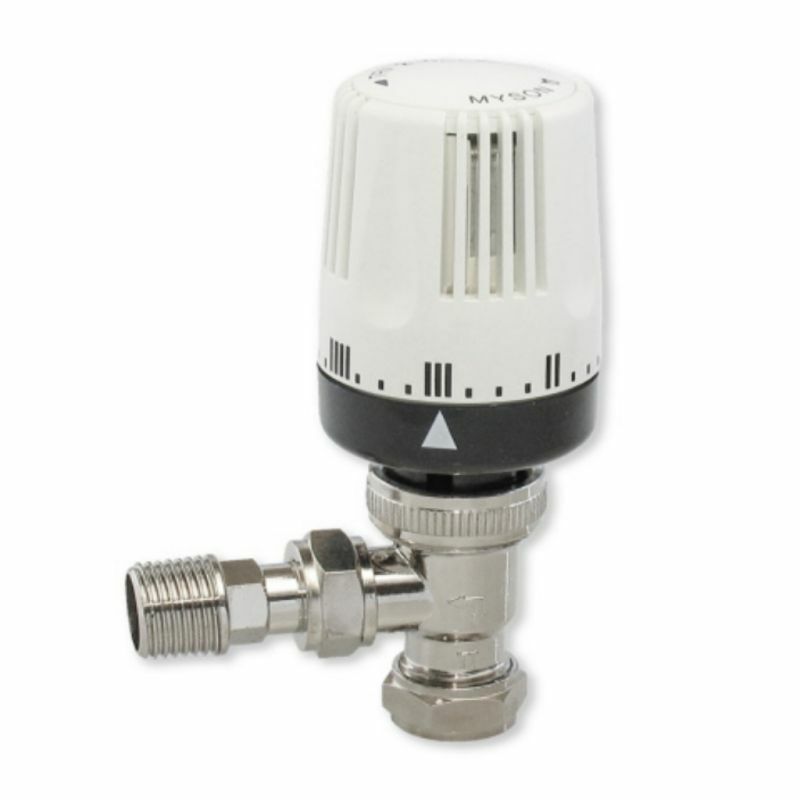 Myson thermostatic radiator valve commissioning cap. Used to temporarily replace TRV-2-WAY valve head, during maintenance work. Replacement head for Myson TRV-2-WAY thermostatic radiator valve. 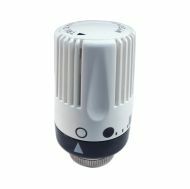 Interchangeable with the standard Myson thermostatic head (which looks the same, but has red markings and a white bottom section). 15mm Myson TRV-2-WAY thermostatic radiator valve. 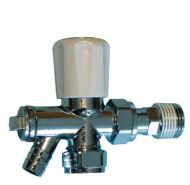 Approved to BS EN215, liquid sensor, 10 Bar rated, vertical and horizontal mounting, positive shut off. 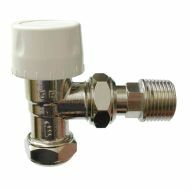 Myson TRV 2 Way Valve Body 15mm x 1/2"
Valve body for 15mm Myson TRV-2-WAY thermostatic radiator valve. Complete with commissioning cap and radiator tail. Myson thermostatic radiator valve thread adaptor. The male thread on the top of the adaptor is the new m30 size and the female thread on the bottom is the old m28 size. Green Pegler Belmont radiator valve O ring. These are sold in singles, you will need to buy two to repair one valve. Red Pegler Belmont radiator valve O ring. These are sold in singles - you will need to buy two to repair one valve. This tail connects a radiator to a standard radiator valve. The male thread is 1/2 inch BSP (normal size for the connections on a radiator). The fitting has a compression nut and olive to suit a valve with a 15mm compression fitting type outlet. Straight thermostatic 15mm radiator valve, with reversible bi-directional body. 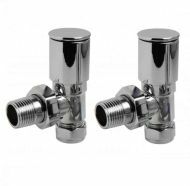 Pair of all chrome contemporary straight towel warmer valves. Lockshield cap for Pegler Terrier radiator valve. Most original items were supplied in grey, though this replacement is white. Wheel head handle / cap for Pegler Terrier radiator valves. Most original wheelhead handles were supplied in grey, though this replacement is white.